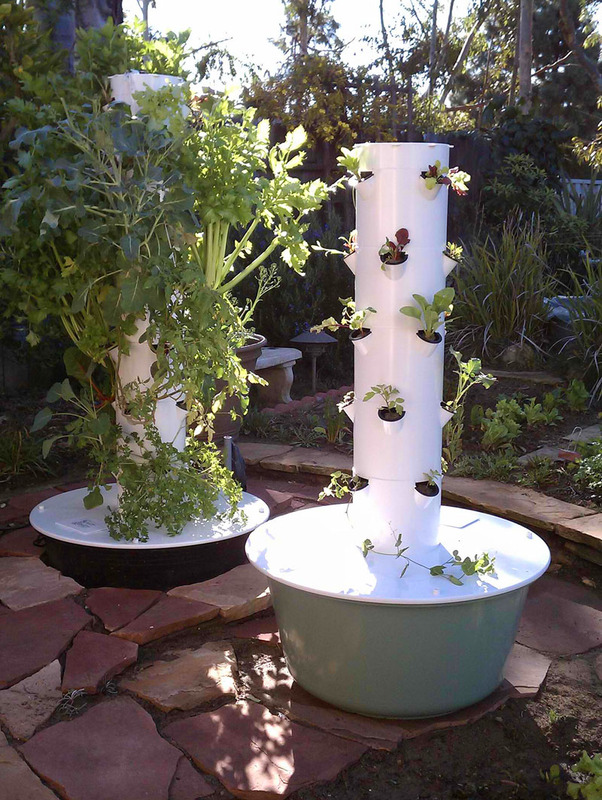 The Aeroponic Tower Garden Vertical Food and Herb Growing System by Juice Plus+ Makes Home Vegetable and Herb Gardening Easy and Affordable for Everyone! 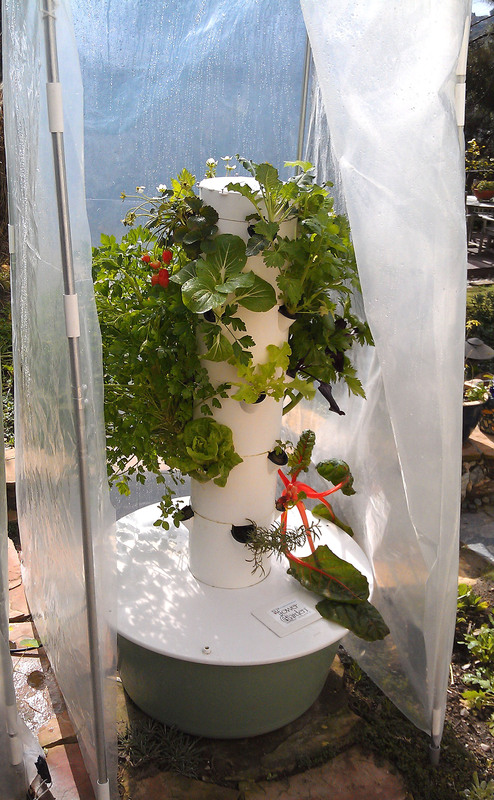 Click here to order the complete vertical Tower Garden growing system. 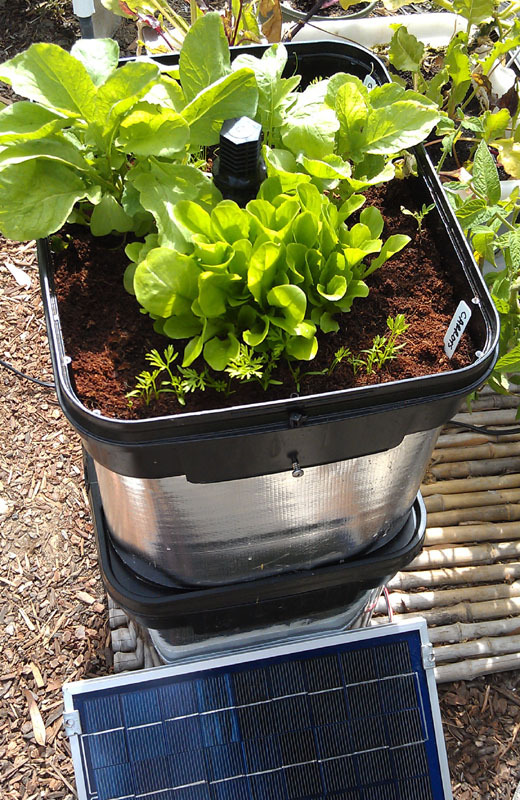 For root and pot plants that can't be grown in Tower Garden have a look at our new hydroponic solar Veggie Garden2go compact growing system that is the perfect growing companion to Tower Garden. 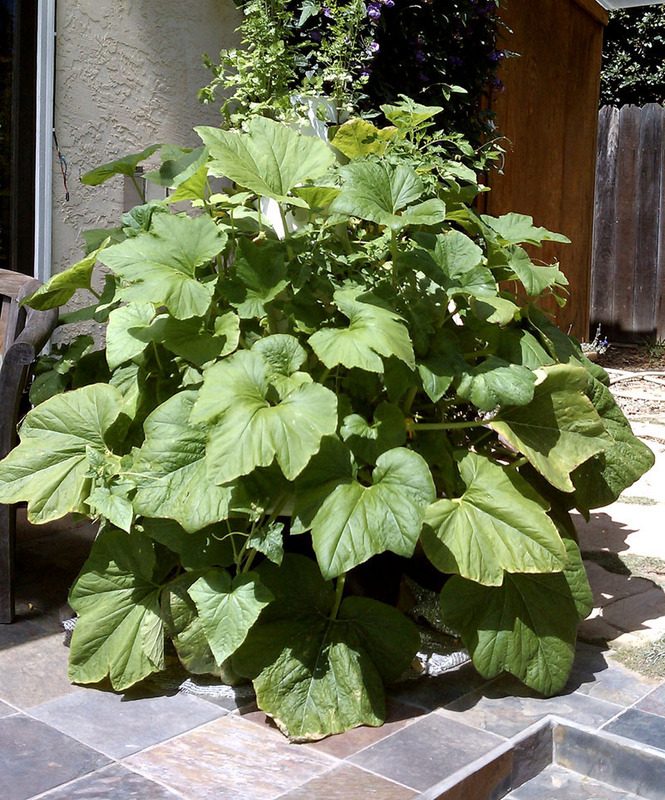 Also, don't miss our unique season extender, plant protection add-on accessories and organic edible seedlings at towergardener.com. 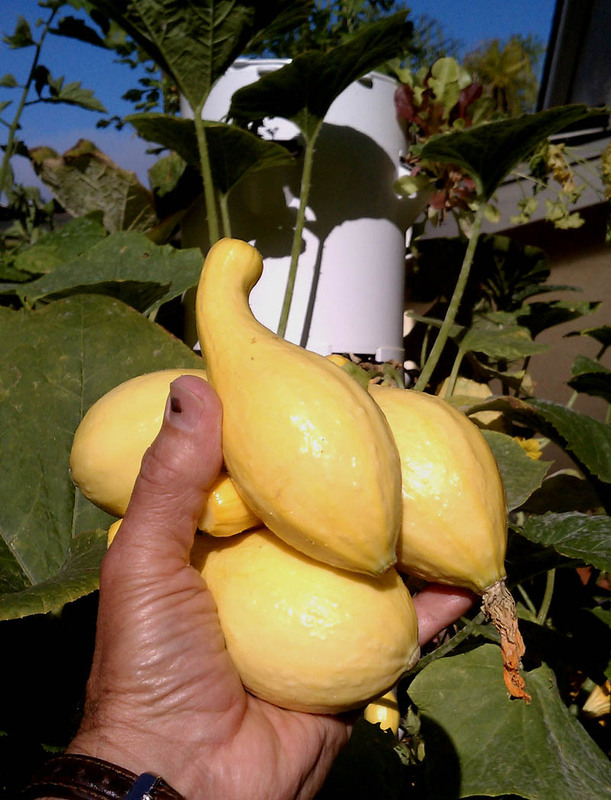 The Tower Garden in the top left photo is filled with 6 week old yellow squash, shown in the closeup on the right. The bottom left photo shows how mature growing plants look in the left Tower and with new starts just planted on the right. The left tower is partially underground for better water temperature regulation in hot and cold months. The bottom right photo shows young carrots, radishes, beets and lettuce all growing in the new Veggie Garden2go hydroponic growing system. Learn how to extend your winter Tower Garden growing season with the ClearDome Tower Greenhouse, left photo, and how to power your Tower with the sun, by clicking here to see towergardener.com. 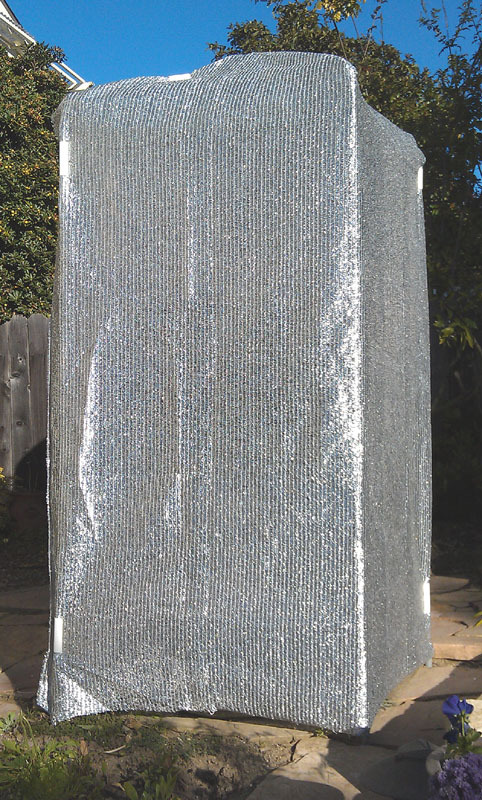 We also have solar reflective Thermal Barrier Fabric, right photo, and water cooling reflective foil to better protect your plants from hot summer temperatures, as well as Towernet for repelling birds and animals. For many areas, you can grow food and medicinal cannibus all year, which makes it the perfect urban survival garden. And, have a look at this remarkable detailed scientific study from the University of Mississippi that was recently published showing an increase of yield by up to 65% for eight different types of greens and other food plants compared to the same types of field grown plants. It also shows that Tower Garden grown food plants have comparable or better phenolics, flavonoids, and antioxidant properties as the same field grown plants when picked a peak ripeness. While the study did not mention how much loss of these properties there is when food plants are picked 1-2 weeks before they are ripe, as are most store-bought food. Plus, it did not mention the loss of flavor or vital nutrients, which by many estimates can be as much as 30-40% by plants picked before their prime. Growing your own fresh food at home with a Tower Garden means you always will get maximum ripeness, critical plant properties, taste and nutrition with no harmful chemical toxins from synthetic oil-based fertilizers or non-organic plant sprays. 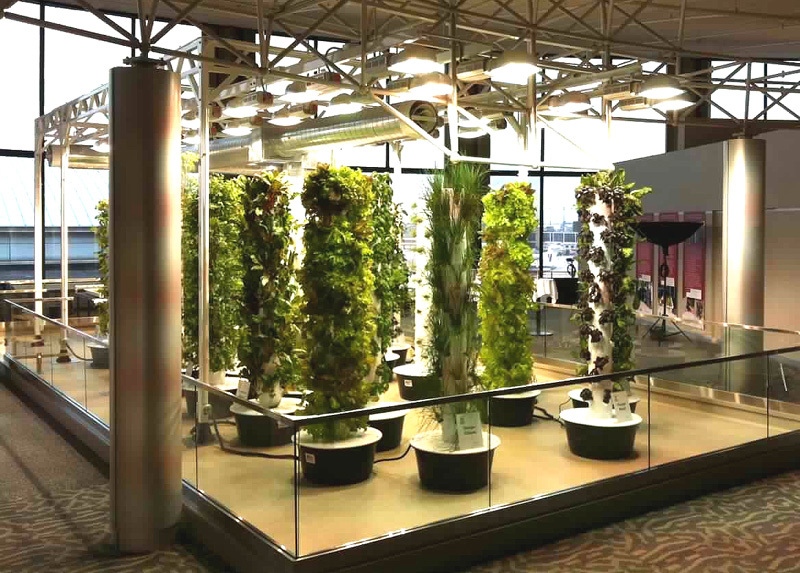 A growing number of public Tower Garden public and private Tower farming locations have already been set up around the country, and the left photo shows a working indoor Tower Garden display at O'Hare International Airport in Chicago. Over two dozen connected Tower Gardens are set up inside the terminal with indoor lighting. The harvested food is so delicious that it's served in nearby airport restaurants. More than 100 commercial Tower Garden farms and restaurants around the country are now in operation and many new installation plans are in development throughout the world. 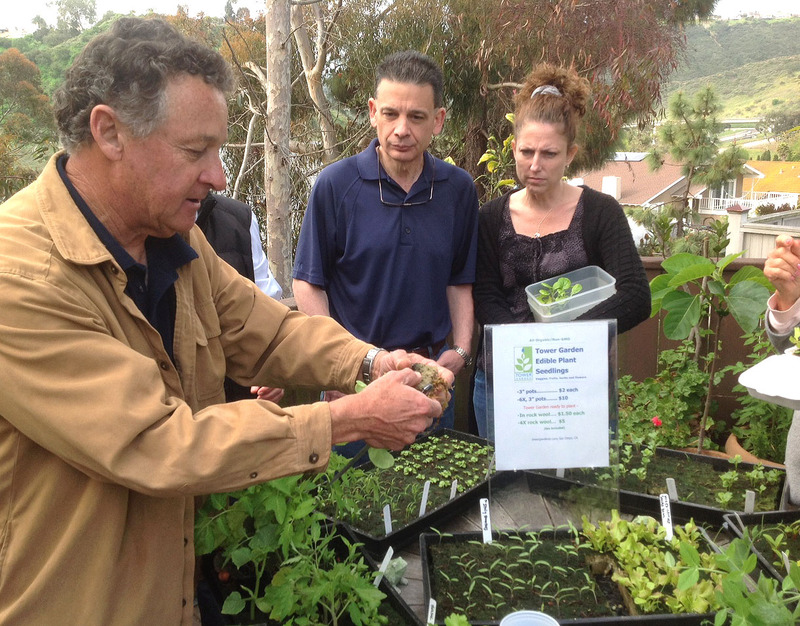 For upcoming public Tower Garden demonstration dates in San Diego, California, including our monthly introduction to Tower Garden and JuicePlus+, and to purchase a wide variety of over 1,000 organic/non-GMO edible Tower Garden-ready fruit, veggie, herb and flower seedlings click here for pickup in San Diego, CA by appointment or by mail order online. 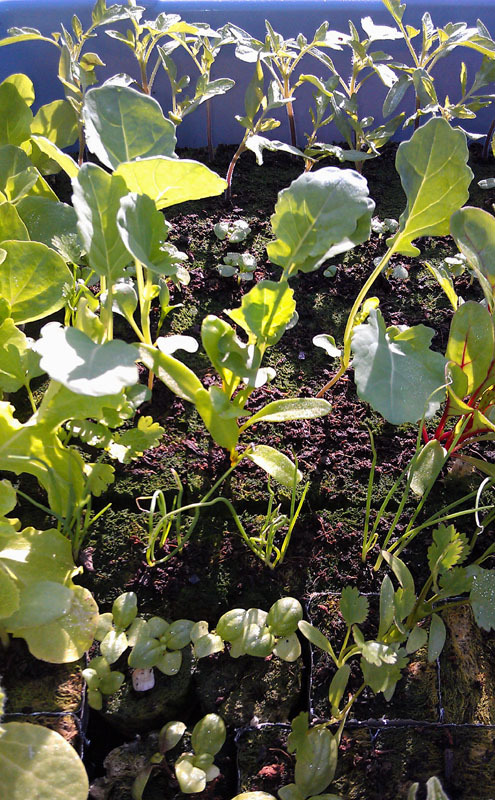 Tower Garden seedlings (left below) in San Diego by appointment, or any TG related questions contact San Diego distributor and trainer Deris Jeannette at: deris@towergardener.com or call him at 619/990-7977. If would like to learn more about to how grow your own healthy and pure organic food, herbs and medical marijuana at home without soil, click here for 5 easy tips. For more Juice Plus+ products and distributor information call Sky Jeannette at 858/677-0707, or email her at: sky4health@sbcglobal.net. To learn more about the next best thing to fruits and veggies at her Juice Plus+ home page click here: Sky4health.com. © 1999-2014, ClearDome Solar Thermal, 3268 Governor Dr, #153 San Diego, CA 92122 U.S.A.